You know, given her name, you'd expect her personality quirk to be that she's clingy. Poison Ivy, aka "Ivy," is a genius when it comes to biology of plants. Being shy and far more comfortable with plants than people, Ivy spends most of her time in the Super Hero High greenhouse. While she has the power to control plants, they can sometimes get out of hand. 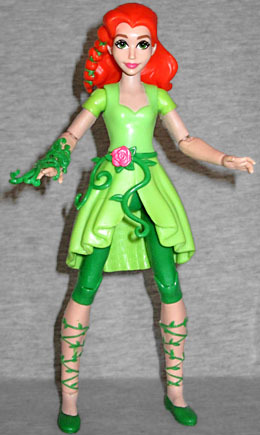 It's not weird that Poison Ivy is one of the Superhero Girls - remember, in the New 52, she's more of an eco-activist than a villain, so having her skirt the difference between hero and villain ("friend and bully"? "bestie and mean girl"?) for this new property makes sense. The website, which calls her a "garden variety" misfit, even gives a hint of her origin: when a botched lab experiment gave this wallflower the ability to control plants, her life changed forever; now, she's finally blossoming into her new life, and doing the best she can to adapt to her amazing new super powers. They say Ivy's shy, but she's really just socially awkward - nobody who puts this much effort into a hair design is shy. Her big orange hair has a pin-up style wave on the front, and a large braid/ponytail thing bound up by a thin green vine. In the animation it falls over the front of her shoulder, but the toy isn't that complicated. Speaking of complicated, her dress isn't. As you may well be aware, there are several different lines under the Superhero Girls brand - action figures, dolls, and roleplay/fashion. 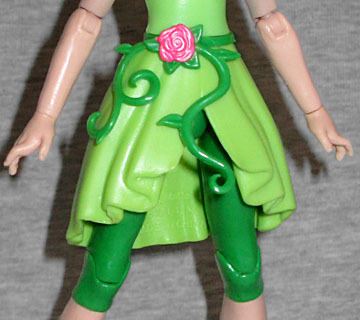 The Ivy doll has a complicated floral lace pattern on her dress, while the action figure's is just a solid green. The cartoon version does the same thing, because a complex pattern would be too hard to animate, so that's a fine choice. She wears darker green capri tights beneath the dress, matching flat shoes, and has vines wrapping all the way up her bare shins. Her dress is cinched with a long green vine that has a big pink flower blooming on it. During the initial rounds of design, Ivy would have worn a big scarf, too: it was the girls playtesting the line who pointed out that a scarf would just get in the way during a fight (they also said the prototypes were too pretty, and that Wonder Woman wasn't athletic enough, so take that, stereotypes). If you watch Ivy's spotlight video, you'll see she has a few pet plants that she knows by name, but sadly this figure does not include any of those. She does have an accessory, though, in the form of a bundle of vines that can hug her arm. A few tendrils reach off the front, suggesting she's growing the vines at some target - you can decide what! The figure has a balljointed head and neck, swivel/hinge shoulders and elbows, swivel wrists, swivel/hinge hips and knees, and swivel ankles. Yes, swivel. Not hinged. They turn, they don't point. Probably to make sure the toy lives up to the package's claim that "action figures stand on their own!" The packaging is pretty nice. It's a fairly compact blister card, with a large, curved bubble that takes up about 85% of the entire front. 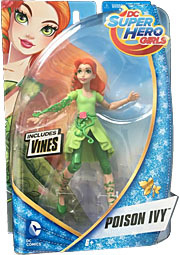 A drawing of the character is in the upper left corner, and there's a swooping blue and gold cardboard insert with the figure's name and a golden icon that represents them - Ivy's is, of course, ivy. And yes, despite this being a line aimed primarily at girls, the packaging is blue, not pink; wow, it's almost like somebody's finally decided that maybe binary colorschemes are just a stupid 1980s trend and should be treated with the same honor and respect as shoulderpads, sweatbands, and leg warmers. Blue for boys and pink for girls is the gender equivalent of a Flock of Seagulls haircut, except hidebound chuckleheads don't get mad if you try to change that. It's no secret that superheroes are mainly a male fantasy - the women represent a male view of the ideal female, and the men represent a male view of the ideal male (sorry, dude, big huge muscles are a thing you like, not a thing your mom or your sister or the woman-on-the-street likes). And yet despite this, when they were doing research ahead of creating this line, Mattel discovered that 9% of all action figures were already being bought by girls. None of the shows, comics, movies or games are made with them in mind, and yet they were already there, buying the toys. So if Mattel makes a line that's specifically aimed at girls in order to tap that market? More power to them. Twilight didn't ruin Comic-Con, and action figures of girls aren't going to ruin our hobby. They're going to make it more diverse. 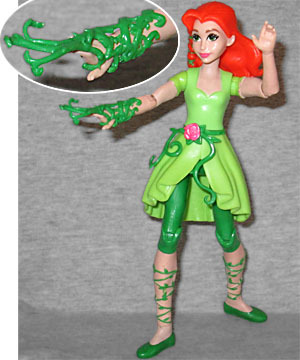 And this Poison Ivy may not be dressed (or undressed) like her comic counterpart, but she's a fun action figure.